4 Putting sports betting revenue back into sports? 7 Room for athletes in responsible gambling campaigns? 8 Legal betting on high school sports? 9 Is sports betting a unique form of gambling? Can you picture an alternate universe in which all stakeholders in the legalization of sports betting across the U.S. collaborated beforehand to figure out the best way forward, rather than the current state of affairs? 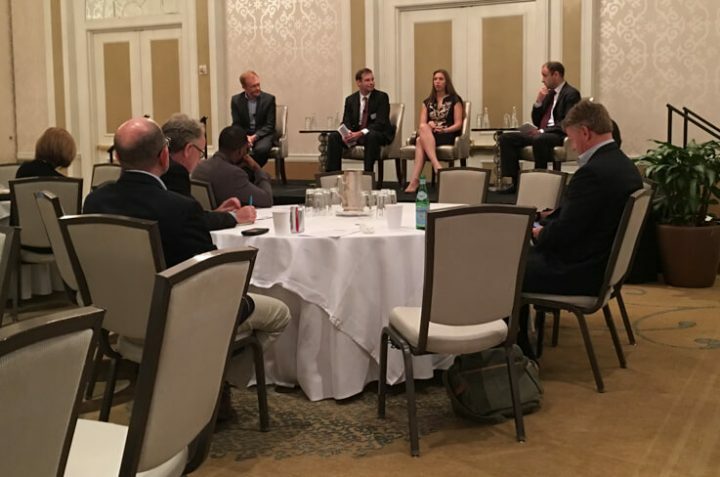 Whether intentionally or not, that theme was at the forefront of The Aspen Institute Sports and Society Program’s “The Future of Sports Betting: Reimagining Its Public Value” panel discussions at the Fairmont Hotel in Washington, D.C. on Friday. Over the course of two hours and with the help of six panelists and two moderators, the discussions brought home the current chaotic, piecemeal legalization environment — and what could have been different. One thing the large pro sports leagues want to be different is them receiving some sort of small “integrity fee” from gambling revenues. Major League Baseball Senior Vice President Morgan Sword made the case. In the U.S., however, five states already are now offering sports betting, and none of them are paying these royalties. Sword is cognizant of that fact, but not giving up. When it was suggested that the “integrity fee” ship had sailed given that 0-5 record, Sword disagreed. “There is a legitimate argument on both sides for whether or not legalized sports betting is a good thing, in aggregate, for our country,” Sword said. “But it no longer matters what our position is on that, because it’s here. So rather than hand-wringing around whether we are for it or against it, we decide to study the countries around the world that offer sports betting and find out the absolute best way to do this. We want to maintain what I feel is a unique sports culture in the U.S. that is such a big part of being an American. Start spreading the news … when it comes to the integrity fees sought by MLB, the NBA, and the PGA Tour, most, if not all, of the chips are going in the New York basket. The organizations have a long “offseason” to try to persuade New York State lawmakers returning next spring to endorse the integrity fee plan — or at least not object to it. Sword, Sportradar US executive Laila Mintas (whose company provides official data for the NBA and NHL and countless others worldwide), National Council on Problem Gambling Executive Director Keith Whyte, and renowned gaming law attorney Daniel Wallach all made different but valid points that, ideally, more legalization challenges would have been worked out before this state-by-state rush began. Sword is right that several states didn’t even wait for the Supreme Court to rule before approving sports betting laws. But that’s no surprise. Once the Court agreed last year to take the case, any savvy set of legislators who had majority support for sports betting would have been foolish to delay. The leagues scrambled to try to get integrity fees included in the early legislation. They got the backing of Governor Jim Justice of West Virginia, but the state’s legislature ignored the advice. Representatives of the NBA, MLB, and PGA fared even worse in Trenton, with New Jersey Assemblyman Ralph Caputo angrily dismissing their pleas and practically evicting them from the hearing. Let’s pretend that the leagues had settled with New Jersey — perhaps even gaining an integrity fee in the process — rather than fighting them in court for six years. What else might we now have that, instead, we don’t? Wallach, the sports law attorney, backs an “integrated sports betting platform” where betting information is shared by all gambling states on a mandatory basis. 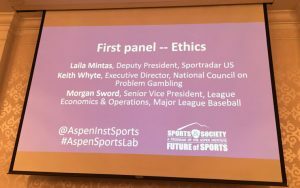 Wallach got agreement from several fellow panelists that being able to track possible “match-fixing” — cheating on a sporting event — in real time would help lead to arrests as well as to discourage such future schemes. Ohio state Senator Bill Coley, the president of the National Council of Legislators from Gaming States, agreed in concept, but isn’t yet convinced such a process should be mandatory. Not only is no such framework in place now, it doesn’t seem to be coming anytime soon. Putting sports betting revenue back into sports? Not only is that an interesting idea, but Norway and China already funnel their sports betting and lottery revenues, respectively, back in that way. Colorado, meanwhile, uses its lottery revenue in a unique way: 50 percent goes to the Great Outdoors Colorado Trust Fund, 40 percent to the Conservation Trust Fund, and 10 percent to Colorado Parks and Wildlife. So states may want to think about their own priorities for newfound sports betting funds. But Cove already is behind the eight ball — and like the leagues, his best hope might be to find one state that is in his corner, then promote that approach to subsequent states. Whyte, the advocate for compulsive gambling relief funding, notes that until 2005, Nevada’s state government didn’t allocate any annual funding at all for such aid. He also said that the new states coming aboard, in many cases, are jumping ahead and creating new gamblers, even as funding for the inevitable troubled bettors does not keep pace. Whyte also explained why his group is neutral on gambling topics — a trait shared by similar groups, to the surprise of many. Wallach said brick-and-mortar casinos in a few states may want to enjoy the sports betting bonanza while they can. That sounds obvious to those in the sports betting industry. But while New Jersey offers it, fellow new states West Virginia, Delaware, and Mississippi do not. So what makes New Jersey different? What propelled the state forward while others have proven hesitant? It’s the state’s experience with online casino gaming over the past five years, and a change of heart by brick-and-mortar private casino owners before that about recognizing that claims of cannibalization from online play were wildly overstated. With eight online sports betting operators already in play in New Jersey, and more right behind them, the September revenue figures that will come out in four weeks are expected to show a massive edge for those books over their racetrack and Atlantic City casino counterparts. That may change the tune of legislators in other states. “When you walk into a sportsbook and make that bet at the window, we have no idea about who you are and whether you have made other bets,” Sword said. Room for athletes in responsible gambling campaigns? Another potential partnership — back in our alternative universe now, where we figure this stuff out before moving forward — would be having leagues meet with sports betting operators to try to reach agreements on what betting to include and what not to include. Getting operators to agree to not offer minor league baseball odds would be one example, Sword said. Mintas said that should be easier for operators to accept when there is no significant online, black-market alternative, as is the case for minor league ball. “Smaller bets during the course of a game, such as whether the first pitch will be a ball or a strike — that kind of bet is problematic for us, because it’s very easy for an individual player to manipulate the outcome of that bet and very hard for us to detect,” Sword said. This summer’s Home Run Derby was won with a late rally by Washington’s Bryce Harper over the Cubs’ Kyle Schwarber, though there were some questions raised by whether Harper’s batting practice pitcher was throwing some pitches too quickly after the previous one. Legal betting on high school sports? Well, New Jersey doesn’t permit operators to offer bets on high school events or on other events that may involve participants of that age. And I’ll believe a state lets a casino or track offer odds on high school sports when I see it. Is sports betting a unique form of gambling? Sword had a retort for the oft-cited point that in the U.S., the states control regulation of horse racing, dog racing, jai alai, casinos, the lottery, etc., so why should sports betting be the exception? Finally, Coley, the Ohio elected official, had this quip about his state. 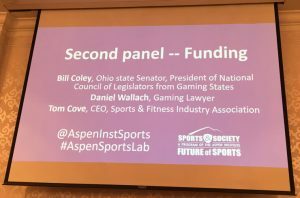 “Sports betting must not be a problem in Ohio because since January 2008, there have been 12 arrests for bookmaking in the state of Ohio,” Coley said. Coming tomorrow: Exploring why we have this U.S. sports betting reality instead of the one described above. The Chaotic Nature Of U.S. Sports Betting Expansion — How Did We Get Here?